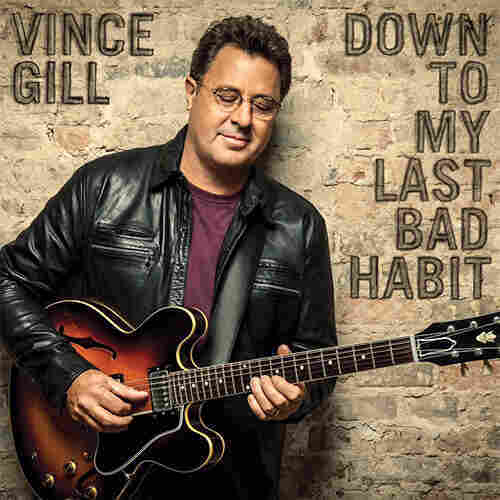 Review: Vince Gill, 'Down To My Last Bad Habit' Gill can't be surpassed at fully formed feeling, which is what makes him one of country music's greatest and most graceful romantics. Fame can be a myopic beast. Whatever first lands a person in the spotlight is the thing most likely to keep attracting attention ever after. Throughout Vince Gill's late-'80s-to-late-'90s commercial heyday in country's mainstream, it was his sensitive ballads — many with adult-pop sheen, some with modern honky-tonk melancholy, all sold by the lustrous anguish of his singing — that served as his primary calling card. His other strengths took a backseat. Now, Gill is in a unique position, having reached the phase in his career where he's feted for lifetime achievements (most notably with an induction into the Country Music Hall of Fame) and still possessing the backing of a major label and the drive to refine his musicianship. He's spent the past decade indulging his varied interests and flexing his chops with a string of albums spanning bluegrass and blues-rock, a Western-swing side gig, a guitar-centric outing, a throwback country collaboration with a celebrated steel guitarist, and plenty of other ventures. On Down To My Last Bad Habit, Gill continues to work from multiple musical angles while also bringing into focus perhaps the greatest of all the skills he's cultivated over the years: his ability to translate his devotion to craft into richness of expression. As is often the case for him — especially these days — he had a hand in every facet of the album-making process, recording in his home studio, co-producing with respected engineer Justin Niebank, writing or co-writing every number, laying down lead-guitar tracks, and singing a lot of the background vocals. The refined simplicity of Gill's writing comes through in "I'll Be Waiting For You," its plaintive melody gently exposing the pain in the words' patient pining, and "One More Mistake I Made," a rumination mellowed by its lilting tune and Gill's subtle vocal shadings. When Gill's vocal attack grows inflamed during "Reasons For The Tears I Cry" — and when he pleads with a long-gone lover in the title track, softly tugging on the melody with vibrato and ruefully elongating notes — his need is made suppler by the seasoned grooves beneath it. There is, as you'd expect, a big ballad in the batch; the verses of "I Can't Do This" build in quiet agitation until Gill has had all he can take of watching the woman he loves replace him. He powers his clear, rippling tenor to the high notes, buoyed by a meticulously constructed swell of guitar and synthesizer. Friction has no place in Gill's music, but he can't be beaten at fully formed feeling, which is what makes him one of country's great, graceful romantics.